BACKGROUND: Transanal ileus tube is introduced into obstructive colorectal cancer in October, 1997 in our hospital, and many cases of obstructing colorectal cancer successfully managed by preoperative lavage using transanal ileus tube. Moreover, because transanal ileus tube was originally developed, decompression tube was transanally inserted into the colon more safely than before. In addition, in December, 2005, a one-stage laparoscopic colorectal surgery is performed after preoperative lavage using transanal ileus tube for obstructive colorectal cancer. STUDY AIMS: Safety and the validity of pefoming laparoscopic colorectal surgery after preoperative lavage using transanal ileus tube for obstructive colorectal cancer are examined. PATIENTS AND METHODS: A total of 153 cases of laparoscopic surgery for colorectal cancer in our hospital between April, 2004 and June, 2007 were studied, these cases were divided into two groups: Group 1, in which operation was done after preoperative lavage using transanal ileus tube, and Group 2, consisting of cases undergoing colectomy without using transanal ileus tube. Group 1 included 12 cases and Group 2 included 141 cases. Group 1 was compared with Group 2 relative to operative time, amount of bleeding, postoperative hospitalization, morbidity rate and SSI rate. RESULTS: There were no significant differences between Group 1 and Group 2. But, Group 1 were a little high for operative time and SSI rate. 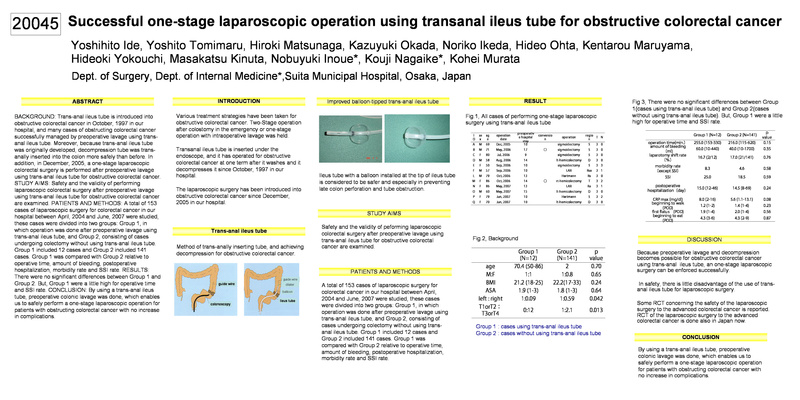 CONCLUSION: By using a transanal ileus tube, preoperative colonic lavage was done, which enables us to safely perform a one-stage laparoscopic operation for patients with obstructing colorectal cancer with no increase in complications.